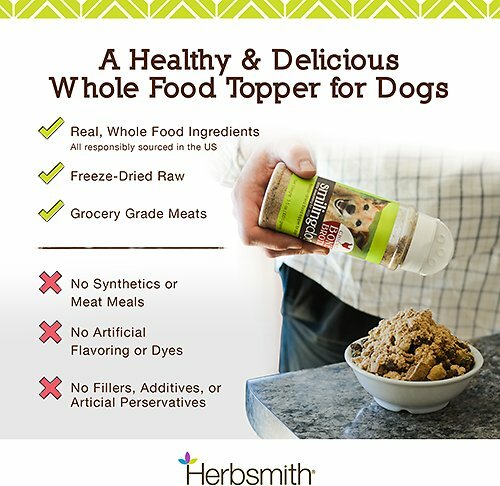 Perfect for even the pickiest eater, Herbsmith Smiling Dog Kibble Seasoning Freeze-Dried Chicken with Apples & Spinach Dog Food Topper provides great flavor while adding a healthy protein source to any kibble. 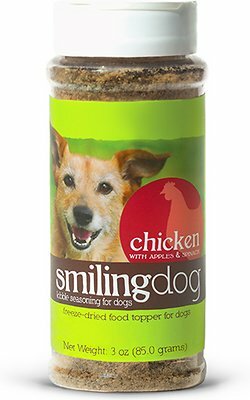 Sprinkle it over your pets' food and they'll be sure to smile! Sprinkle it over your pets' food and they'll be sure to smile! This is a meat product - handle as such. Always wash your hands, utensils, and surfaces with hot, soapy water after handling meat. Keep away from children. Store in a cool, dry place. Freeze-Dried Chicken with Apples & Spinach. Sprinkle generously over kibble. Recommended portion: 2 - 4 teaspoons per cup of food. 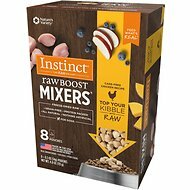 What if my dog/cat won’t eat the powder? 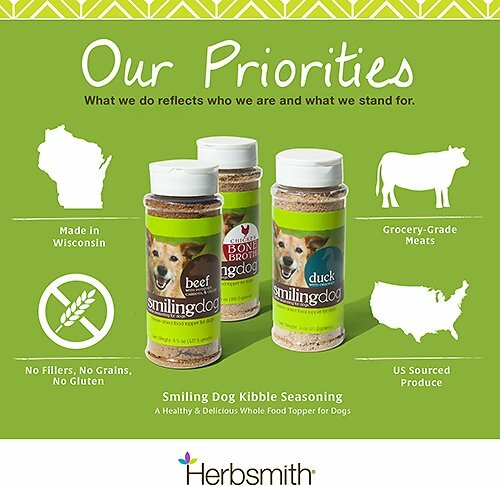 Though Herbsmith herbal blends are very palatable when mixed during mealtime, occasionally dogs are hesitant to eat the herbs because of the unfamiliar taste and smell. If a dog is hesitant, simply try adding a pinch of the powder during mealtime to gradually acquaint them with the blend. Slowly increase the amount given each day until they eat a full dose without hesitation.Alternatively, you can mix the powdered herbs with applesauce, yogurt, cottage cheese or any other dense or moist food.Also, fillable capsules can be purchased at most pharmacies. The powder can then be loaded into the capsules and administered like a tablet. Most pets easily eat tablets covered in peanut butter, cheese spread, liverwurst, etc. When deciding whether the tablets or the powdered blend would be best for your dog, you should take into account what type of food he/she eats. Owners that feed their dogs a raw, real, or moist food diet tend to like the powdered blends because they can simply be mixed in during mealtime.For dogs that are finicky eaters, we suggest the tablets. The tablets have the same ingredients and composition as the powdered blend, with the exception of a few binding ingredients that must be added for the tablets to compress. Our individual ingredients are sourced from China. The phrase “Chinese herbs” came into existence because the soil in China provides a far superior environment for the herbs to grow. Our herbs are sourced individually from specific providences of China because of the optimal growing conditions (drainage to the soil, sun patterns, quality of the soil, etc.) For example, only the providence of Shanxi has grown astragalus for thousands of years because its conditions consistently provide the highest quality.However, each and every batch of herbs that we bring in to make our formulas is tested in the U.S. to ensure purity, authenticity, and safety. I got this for my golden retriever. I try to add toppers to his kibble every now and then so he doesn’t get bored of his regular food. 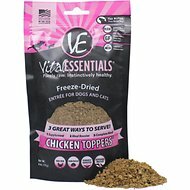 I thought adding a seasoning would be a great idea and a good way to save money compared to buying food toppers (because who ever uses a whole container of seasoning?!) However, I was a little disappointed with this. My dog doesn’t mind the taste and he’ll eat his kibble when I sprinkle some on it but it’s definitely not his favorite. He doesn’t get excited about this the way he does about other toppers. I’ll be sticking with other food toppers that he loves. I’d rather pay a little bit more on something I know he’ll love. I just received this and was hoping it would be the answer for my picky eater. He ate it the first two times. This morning I sprinkled it over his food and he ate a little bit and left the rest of his food. He loves it by itself but isn't really interested in it on his food. I have two very spoiled dogs, we used to mix a little wet food in with their dry food but money got a little tight so we stopped ordering the wet, well they didn't want to eat, of course. So we decided lets try some of these spice toppers and they LOVE them, and I love the ingredients! They eat their food with no problems after sprinkling this on their food with a little hot water. I am going to buy some for my mother-in-law for her picky eater, also! My dog is a very picky eater. I mixed this on with a can of food that she really did not care for and she cleaned the bowl. I would recommend this for all of your picky eaters. My Mastiff, Barney, loved this. Chicken and apples are among his favorite foods (surprisingly, apples more so than chicken, in fact, I can't eat an apple without him sitting in front of me drooling all over both of us). However, Roxy & Wyatt weren't quite as thrilled with it. They really liked it for about 3 days, then the novelty wore off. They are both VERY picky eaters, which is why I tried it, trying to keep their kibble new and interesting. Oh well, Barney will finish it. We have 5 German Shorthaired Pointers. We feed a salmon, sweet potato & pumpkin food which they occasionally become bored with. Until we discovered this chicken, apple & spinach topper! They also really enjoy the duck & oranges flavor. This is great! My bloodhound has an EXTREMELY senistive stomach and has to eat the same dry dog food over and over. I put a dash of this on and some water and he finally can eat a different flavor. Love it!!!! I have a very picky hound. I was so excited when I read the reviews on this product hoping it would make him actually want to eat his food. I was pretty bummed when he wasn't any more excited about his food with this seasoning on it... in fact, he gets way more excited about cheese :( I really wanted to like this product but am disappointed by its results. My other dog however loved it- she'll eat anything though.